Main Entrance. All of these photos are from my phone unless noted otherwise. After some inspiration hit me last year, I made the decision to finally do something I’ve been wanting to do for years now. 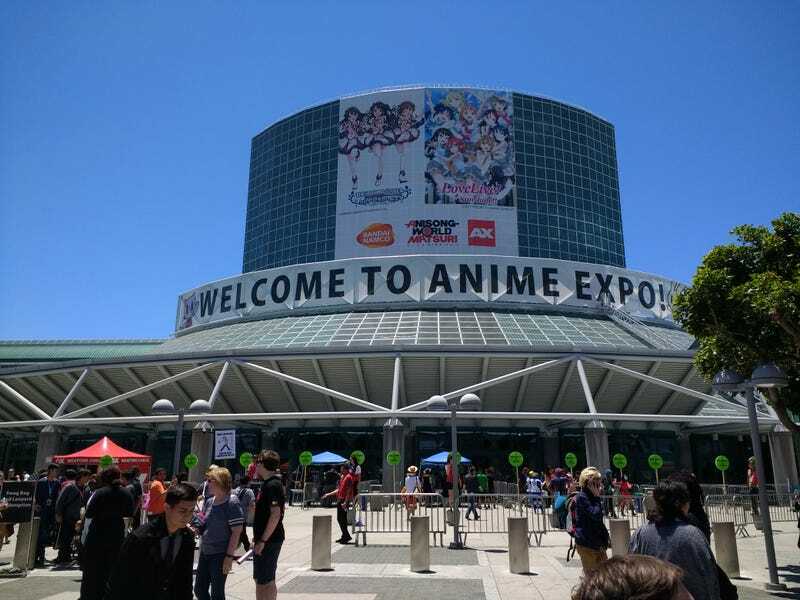 This year, I flew to Los Angeles to attend Anime Expo for my very first convention! In what I’m expecting will be a short series, I look back at my journey and reflect on what I did and saw, but also share my thoughts and criticisms throughout the process. The con had so much going around it during my 4 day trip that it was impossible to try to do everything. Leaving AX, I had mixed feelings about the convention. From special guests to exclusive panels and events, there was a lot to love for any Anime and Anime adjacent fan (i.e. games, music, etc. ), but there was also a lot of baggage that came along with it that I will go into further detail below. As my first article took on a life of its own (I’ve been working on this inconsistently for the past two weeks! ), I’ll be dividing this by day or a set of days starting with the night before the con and Day 1. Here it is: the good, the bad, and the worst moments of Anime Expo 2018. So I didn’t actually attend the Pre Show Night as that was an extra fee, but I did happen to be downtown in Little Tokyo on a rather slow 4th of July. Though the foot traffic was light, I observed quite a few groups wearing AX passes around their necks along with a Persona 5 tag advertising the two new Dancing spin offs on one side. I was in town with some friends and walked around for a bit and do some light shopping. Though I would be attending the con solo, my comrades spent the afternoon with me conversing with ourselves as we noticed the increasing number of con attendees as the afternoon grew darker. That night, my anticipation was building. I had hundreds of questions I wanted to ask and was mentally preparing myself for the following morning. I spent a lot of time considering what I’d be bringing along to what shirts I would be wearing. Prior to the trip, I had settled on 3 game themed shirts, leaving the 4th day open for any new shirts that I might acquire. I debated between my Soldier 76 and Reaper T-shirts, but ultimately settled with 76 to at least be somewhat approachable (and avoid making my identity too obvious, lol). I had high expectations about Day 1, but absolutely no game plan on what to expect as soon as I arrived other than the official App I downloaded the week before and whatever I had packed as essential for this trip. However, I did peek ahead of time of what the timeline looked like on Day 1 and immediately knew the very first event I would try to attend if possible (more on that below). Went to bed with various emotions: excited about the con as a first time attendee, nervous about the number of things that could go wrong (“What if I miss my bus? What do I say if I run into someone famous? What if I get lost?” etc. ), and dreading the long line that awaited me the following morning. I woke up at a rather unusual time than normal, ate a quick breakfast, showered, and checked twice that I had what I needed before making my way to the convention. Since the convention technically opens at 10 am, I figured I could at least arrive an hour early and still get in. My mind and heart were racing as I waited that morning for my ride, still uneasy and somewhat nervous. But I put all of that aside with the side goal of trying to obtain one of the wristbands for the special screening of My Hero Academia: Two Heroes, if at all possible. Looking back, here is where my first screw up started. Arriving slightly past 9, I was greeted by a rather long line stretching a block and around the corner of the street entrance. Asked one of the nearby volunteers wearing a red vest who confirmed my initial suspicion that the line was indeed the line to get into the convention. Over an hour had passed and it was well past 10 by the time the gate was visible (I did not look at the clock at the time). A volunteer appeared making a suggestion to try the front entrance pictured at the start of this article. There were several smaller lines with their own gate that lead into the main convention, but they could not elaborate on the line size. Conversing briefly with one of my fellow line standees, we decided to stick with our current spot out of risk of stepping into another larger line and with the finish line now in sight. Upon passing the West gate, I followed one of the line standees into the convention just until I made it deep enough to pull out my map and head straight into Petree Hall to obtain one of the wristbands for the MHA premiere. Walking at a slightly faster pace without drawing attention to myself, I walked the corridor, passing several cosplayers and the official AX merch store. “I’m gonna come back for that,” I thought to myself, remembering the special pins I wanted to buy as a gift. Making it to Petree Hall, I noticed the small crowd of people, but no actual line. Saw a volunteer and asked if the wristbands were still being handed out. “Yeah, we gave those out about 25 minutes ago. Sorry dude.” she said (I might be misquoting that as it was hard to hear). Towards the end of the con, I would later find out where the actual line for main events were. It turns out I had completely missed it entering the West gate; I was in the right spot! Disappointed, but not broken, I made my way back into AX merch store; they were already sold out of the pins. “Maybe I’ll come back and see what’s left,” thinking I should prioritize the other exhibitors. With nothing in particular planned for the day outside the opening ceremony, I spent the first part of the morning touring the convention. Remembering all of the people with lanyards at the entrance and the note at the entrance asking people to keep their badges visible at the con, I went downstairs to the Artist Alley. These were mostly independent artists ranging their wares from sketches, to pins, patches, keychains, and other random goods. I walked around observing their work which ranged from good to... questionable fan-service. I remember passing one particular artist who had a collection of recognizable anime ladies from various franchises with enlarged breasts when I briefly looked at the artist and hightailed it out of there the moment he looked up. Don’t know if we crossed eyes, but I quickly went the other direction and didn’t look back. Did a lap around all of the artists, but only ended up stopping by one booth entirely as the Overwatch designs caught my eye. Ultimately, I decided to skip buying anything until I reached the exhibit hall. Remembering I still needed a lanyard, I went to the main entrance to grab my swag bag and saw the line outside. Talked to a nearby volunteer who confirmed I needed to badge out and get in line outside for the swag bag. Before that, he suggested coming back later when the line died down, so I thanked him and took his advice before heading into the main exhibit hall. Entering the Exhibit, passing a Dragon Ball related booth. Thinking I’d have a better shot of scoring some cool merch, I entered the exhibit hall and was immediately greeted by a huge Dragon Ball video advertising various media for the franchise ranging from the card game to Dragon Ball FighterZ. Spent most of the day touring the exhibit crowded at almost every turn I made. This would be a recurring theme throughout the convention each day. Tried my hand at several of the main booths, the busiest seemingly the Atlus booth selling Persona 5 related items, but for the most part, it was impossible to even get in line as most of the booths reached their cap (they actually had to turn people down). Walked around some more to get an idea of what I wanted and what booths to revisit at a later date. Towards the back, you started to get smaller 3rd party vendors and a few indie groups selling their wares. After doing one rotation of the exhibit and realizing it would be impossible to buy anything at this point, I decided to break for lunch to give myself some breathing room. Having accomplished very little, I was overwhelmed and feeling a little frustrated at this point as I settled for the bag of chips and water bottle in my bag after surveying the area. It was barely 1 pm and I was already thinking about calling it quits. An ad I came across while trying to find a lunch spot. Not wanting to end the day on a sour note, I settled on attending the opening ceremony at 3 pm before ending the first day. With some time to kill, I hopped back to the exhibit hall to see if the lines had died down; they had not. Walked around some more when I noticed what appeared to be a small audience gathered at the Toei Animation booth. This particular booth was most notable in that it was one of the few not actually selling anything upfront, but more of a mini museum highlighting some of their most recent projects (DBZ, Digimon, and One Piece). I hadn’t noticed this booth right away when I first arrived that morning, but was drawn to it on my second run as there was something happening. A small crowd had gathered at what appeared to be a mini stage near the Goku statue at the front of the Toei booth with a host talking to two special speakers about Dragon Ball. I had a hard time immediately putting the names to the faces, but there was something oddly familiar when they each started talking before it finally hit me who they were: Monica Rial (Bulma) and Sonny Strait (Krillin)! Left to Right: Monica Rial and Sonny Strait at the Toei booth. I stayed around during the talk as the audience began playing a game with the voice actors by asking DBZ related questions. Unfortunately for me, my knowledge of the series is pretty limited (I started with Dragon Ball FighterZ for context), but I watched as the fans managed to answer with almost lightning speed. My favorite moment occurred when Sonny asked what was Krillin’s ringtone during a particular moment in Dragon Ball and he commented that it probably should have been Sniper King’s theme song; a brief nod that he also plays Usopp in One Piece. Once the talk had ended, the host mentioned there would be other appearances throughout the convention, so I made a mental note to stop by again later in the week. With my spirits lifted, I made my way to the line for the opening ceremony. I remember arriving about 30 minutes in advance and following one volunteer who was directing foot traffic to the line. In a lot of ways, this would be the first taste of the art of line waiting I would get for the days to come as we “snaked” our way outside and back into the main hall to grab seats. They don’t allow photos inside the main events, so here’s a One Piece photo instead. A pretty realistic summary of my first day! In what would be the last event of the day for me, we watched the two hosts attempt to warm up the crowd and briefly talk about the con itself before segueing into cosplay and something about a major championship happening in Japan. I noted a few nearby audience members making a snide remark in the background and one of the guys next to me was actually..... snoring. “Really?” I thought to myself. After a certain point, the audio was just loud enough to drown it out or he eventually woke up. The rest of the presentation was a combination of AX merchandise advertisement adding salt to the wound you worthless..., a special manga artist guest appearance (I didn’t catch his name or forgot already), and, for those who bothered to stay a bit longer, a special music performance by an artist I did not recognize (curse my long term memory!). Before leaving the convention, I made one final journey into the Gaming Exhibit to see what was up there. The most notable booth was the enormous Blizzard shop stocked with various recognizable characters and franchises (i.e. Overwatch, StarCraft, and some Warcraft I believe). The line was rather long, so I decided to skip it for now. Did a brief walk around the area, but mostly observed the various booths, cosplay scenery, and some local games going on. As tempted as I was to stay and play for a bit, I decided to end my first day knowing I had much more to see and do in the days to come. Day 1 had come to a close. Overwhelmed, exhausted, and somewhat anxious about the rest of the week that would follow, I was in a rough spot leaving the convention. As a first time attendee, I was woefully unprepared both physically and mentally for the onslaught of people who lined up at the start of the con. I made the mistake of arriving later than I should have and ended up missing the first big premiere I was most excited to attend, got lost, and didn’t plan my schedule quite as well as I originally believed. Day 1 might not have been a complete success, but it was a learning experience as I started to pick up the geography and navigate my way through the various sites. I was able to see some voice actors in person which was arguably the coolest experience I walked away with on my first day aside from the brief live performance from that one gentleman who I can’t quite identify (I’ll update this if I find out). I had just gotten a taste of Anime Expo, but had barely touched the surface of what was to come next. Next time: Day 2. Persona 5, Sirius the Jaeger premiere, and my worst story from the convention. Stay Tuned!